Sometimes a sale isn’t impressive. I noticed a sale from one of my favorite stores but then was immediately let down. Now this might be a great deal for certain items but it is not a good deal for 3 wick candles. My most frequent purchases are the 3 wick candles. I always buy items when they are on sale and normally stock up. I have enough soaps to last for the next couple of months. The soap holders and other decorative items do not grab my attention. Right now, any purchase that I make would be 3 wick candles. What the prices used to be. Just a few days ago the candles were buy one get one free. This made a 3 wick candle $12.25 each. About a week prior they were also on sale for $12.95 each. Since the prior sale prices were lower, today’s sale isn’t impressive in my mind. At least it does not work for the items I am interested in. 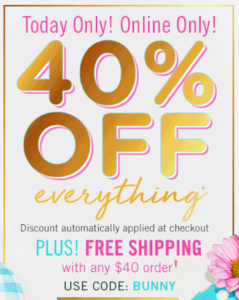 Do you think today’s sale is impressive or not?